Your four-month-old baby is becoming more curious, adventurous and quite the taster! So here's what you should be prepared for now. Your little munchkin is now four-months-old and is perhaps in the most beautiful stage of his life. By now he is more expressive and you will often notice him smiling, cooing, and laughing incessantly. How cute! Also, don’t be alarmed if he tries to raise his head while laying flat on his tummy, it’s just a way to let you know that your lil bub is trying new things and learning to grow up fast. As a new parent you will also see many new physical changes in him. By the fourth month, a baby doubles his birth weight and you probably won’t be able to stop yourself from pulling those chubby cheeks. But this is also a time time when you’ll have to prepare yourself for an emotional rollercoaster. So much so that that joy and pride he’ll give you will have you reaching for the tissues. What is going to happen, you ask? Well, here are a few critical changes you will witness in your bub as soon as he hits this month! 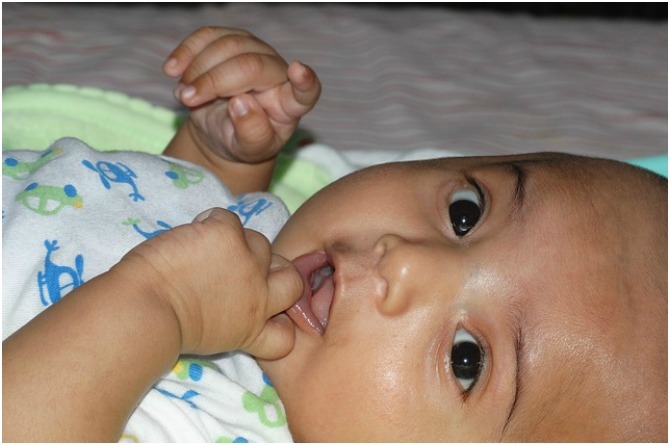 In his fourth month, your baby’s physical development will be faster that you’ve seen so far. He should be double his birth weight, as we mentioned. Steadying the head: You’ll also notice him trying to keep his head steady, unsupported. If your little explorer is super active, you will also see him trying to push his legs down whenever his feet are on a hard surface. Twisting and turning: Since he is just learning to move more frequently by this month, you’ll be running for your video camera to capture the moment he turns from his tummy to back and vice versa. Right now, you’ll see him trying to bring his hands to his mouth, and even push his elbows up while lying on his tummy. Tasting and learning: At this stage, anything that your baby can pick up will likely end up in his mouth. So if you do have a dangling toy or one that makes noise, rattles or even lights up, your baby will try to hold on to it, shake and fling it and put it in his mouth. In fact, you might want to be prepared because it could also be your hair! Remember that when you hold your baby, make sure to remove sharp jewelry pieces from your ears and even necklaces because if it’s shiny, trust us he’s going to want to pull it and put it in his mouth. He will do this primarily because he is becoming more dexterous and using more of his hands. Heightened senses: By this time, your baby's eyes will move together and also be able to focus better on any particular moving or bright object. This is because his vision will now reach 20/40. He'll also be able to pick up colours and contrasts. So if you notice that your baby is not able to move both his eyes together still or seems to be cross-eyed, report it to the pediatrician. By his fourth month, your tiny munchkin will also adapt a stable napping schedule. This means, you'll both be able to enjoy a full-night's sleep. Typically, a baby sleeps for seven to eight hours by this time. And if you factor in one or two naps, you'll see him sleeping for a minimum of 12 to 13 hours per day. So congratulations, you can have your sleep back now! While you notice all these physical changes in him, you’ll also be surprised to notice his fast cognitive development during this month. More expressive: As soon your little one turns four months and his abilities to express will heighten, he will be able to tell you if he is happy or sad more easily. More responsive: This also means that he will respond to your affections more often. So when you call out to him he may look at you and smile, in recognition or your affection for him. Better hand-eye coordination: Also, his hand and eye coordination will have improved by this time. So this means he will spot objects and reach for them more effectively. Since his motor kills will develop further hence forth, you will also notice him spotting an object and moving his eyes along with it. But the best part is the fact that he will be able to recognize those around him. So call out his name because he is listening to you and knows you are talking to him. Continue reading to see how your four-month-old will react to those around him. As far as your baby's emotional and social growth is concerned, you'll be super happy to notice some new development this month. Since your baby is now old to express and respond to emotions, he'll smile more frequently now. Now won't that just make your day! But a response to your emotions and a heightened ability to express also comes with its fair share of tears. If you love playing with your baby and suddenly stop, you may upset him. But worry not, this is new to him too. By this age, he will love to play and may let you know when he wishes to stop or continue. Also, rest assured, if you make faces at him, don't be alarmed if he tries to mimic the same. By this cute age babies tend to imitate what they see and that includes making faces. After all he got it from his mamma! In trying to understand how he may behave or develop, let's not forget that your little bub is going to pick up everything from you. So when you call your baby 'my golu-molu bachcha' in that cutesy sing-song voice, know that your baby will try to copy what he just heard. Although not exactly, but he will start babbling by now. As we often say, "pashto bolta hai," which means he is speaking in his own language. To encourage your baby's language skills, try to talk to your little one just as your would with an adult. Research has shown that the adopting a sing-song voice is good for babies. It helps them learn how to speak faster. You must also use complete sentences and proper grammar and throw in phrases such as “please” and “thank you.” Even if your tot doesn't fully comprehend their meaning, he'll be able to understand the context and draw parallels between the words and its meaning in the future. Continue reading to see the food your four-month-old really needs. 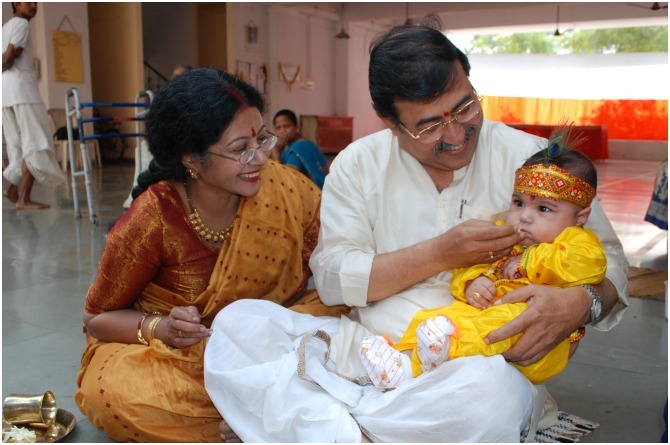 Ideally, doctors advise that a baby be breastfed till six months and start solids only after that. But sometimes bigger babies may not feel satiated with breastmilk or baby formula. Well, if your doctor gives you a go ahead and your baby is able to hold his head steady and sit, you can start solid foods by the fourth month. But remember that your baby's first food should ideally include iron and should be mixed with breastmilk or formula. Our advice is that you should prepare the iron mix in the same consistency as the formula so that your baby gets used to it. Gradually increase the thickness based on his ability to eat and digest. Your little munchkin has only just begun his explorations. And, since he is likely to pick up anything within his reach, try to make that item as safe and baby-friendly as possible. Give him textures to play with: So you can give your baby lots of textures to explore such as books and soft toys. There are chances he might ditch that and pick up a spoon instead, so let him have a wooden one instead. Just make sure the item is not too small for him to swallow and not too big that he hurts himself. Most importantly, have him close by you (while playing) at all times. Sing and talk to him more often: By this age, your baby will also learn to hold his head steady, so plonk him on your lap and sing, play with him or even read him a book. Trust us, he will love to listen to your soothing voice and by now he is also slowly learning to look at your careful and shower you with lost of smiles. Childproof the house: Also, start preparing for a baby who is ready to move around the house and seriously consider childproofing. You can add gates to stairways, lock the cabinets and keep wires away from the floor. Other than that, enjoy this beautiful phase in your and your baby's life and let him be a little explorer.